a row was a big deal for me. It was like I had been neglecting myself that whole time when I thought I was just pushing myself to be more. What I realized was that I needed some time off from the insanely busy life I had been living for the last two years. Unfortunately, I had to go halfway across the world to figure that out. So I decided to come home. I know what you must be thinking— “Seriously? She went all the way to East Africa to study abroad for a month and just went home after a week?” Trust me, it was a difficult realization to make, especially after I had been planning on spending the first third of my summer there since February. Needless to say, there’s a little more going on than I’m willing to broadcast on the Internet. But during the entire time I was there, I couldn’t take my mind off of being home for more than a few minutes at a time. It was like I wasn’t there at all, and it was excruciating. I think in the past I would have probably just forced myself to push through it and stick it out for the rest of the month, but this time was different. I decided that it just wasn’t the time for me to be in a different hemisphere from my family. And I think that was the right decision. In the end, I think the pain of it all wouldn’t have been worth it. That being said, I would like to recount my experiences from the last week here because I do feel like I came away from it with some pretty good memories and plenty of new insights. Let me first say that I have never met kinder, more caring people than in Tanzania. It is not uncommon for one to greet you with the word “Pole”, which literally translates to “Sorry” but is essentially meant as an apology in solidarity for any hardships that you might have suffered in your life. Everywhere we went we were greeted with smiling faces and countless welcoming words. As a jaded American, it took a little time to get used to. 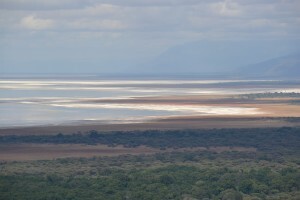 On Friday and Saturday we went on two expeditions to Lake Manyara National Park. On our first visit, our assignment was to identify and document every mammal bigger than a dikdik. We saw elephants, waterbuck, giraffes, zebras, hippos, buffalo, and, of course,baboons. It was amazing! On the second trip, our assignment was to follow a baboon troop and record their behavior every five minutes for two hours. Let me just say, I have never seen more drama unfold than in those two hours. 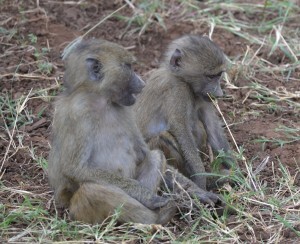 Watching a baboon troop is like watching a soap opera. It was full of fighting, adultery, betrayal, and even a kidnapping! And that was just the first half hour. 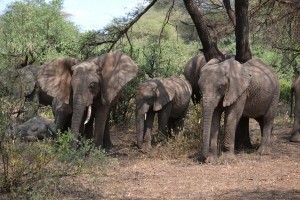 The real treat, however, was the herd of about a dozen elephants resting in the brush next to the road. They were literally about fifteen feet away from the cars, and they were awesome. Also during the last few days, we went to two more markets, one in Mto Wa Mbu and one in Karatu. Let’s just say my marketplace Swahili is now pretty excellent, if I do say so myself. We made friends with this one little boy we had seen on Tuesday at the bigger market in Karatu. His name, like pretty much every vendor at these markets, is Mr. Cheaper and he couldn’t be more adorable. Or more popular. He showed a group of us all around the market in Karatu and, on our way back to the center, had five full Land Cruisers of American college students calling his name and waiving at him as we passed. I’m pretty sure almost everyone bought something from him or at least will at some point. One thing we definitely all noticed at the markets was the popularity of Obama there. Pretty much every little shop and vendor stand sold Obama memorabilia. Some were even named after Obama, like the Obama Hair Cutting Saloon. Hillary Clington (yes, with a “g”) was also pretty popular. It’s interesting how far American culture and politics can reach. There were also plenty of children to play with at any given time around our camp. They couldn’t get enough time with us! Every time we went hiking in Moyo Hill or took a stroll into Rhotia we got swarmed with little kids shouting “Mambo!” and asking what our names were. It was adorable. Except I think one of them gave me a really bad cold. Or at least I hope it’s just a cold… Haha. 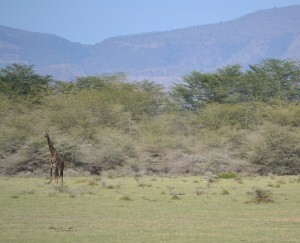 That's a giraffe- I promise. Although I think coming home to spend time with my family was the right decision for me, I’m glad I got to spend some time in East Africa this summer, even if it was only for a week. The people I met there alone made the trip halfway across the world worth it. I’m sad I won’t get to spend three more weeks with the amazing students in my group, but I feel honored to have had the chance to meet them at all. They are awesome and I know they’re having the experience of a lifetime right now! I regret not being able to have the experience I had hoped for in Tanzania this summer, but right now I need to be back on my home continent, and for the first time in two years, I’m pausing to take care of myself. I know I’ll go back someday, I just hope I can remember all that Swahili!